HUNDREDS of ESB pensioners have warned the government it will lose votes in the upcoming local elections if it tries to wash its hands of them. 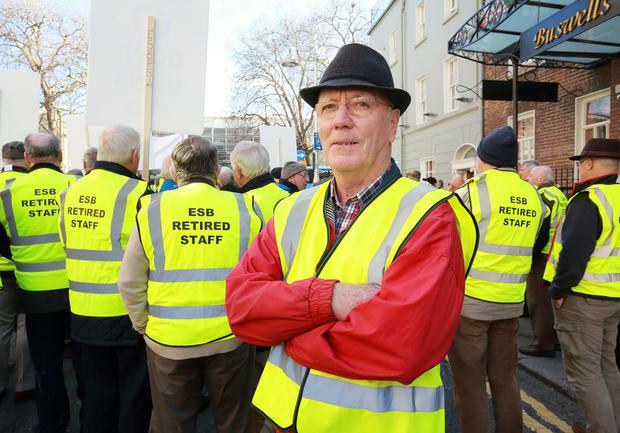 Members of the ESB Retired Staff Association from across the country said more protests are on the way if 9,000 pensioners in the defined benefit scheme are not granted an increase of almost 8pc, at a rally outside the Dail at midday today. The average ESB pension is €26,000, the head of the association Tony Collins told the crowd, which included a strong contingent of Fianna Fail TDs. "We're here to send a message to the people in government buildings that we're here for pensioners' rights, rights of representation," he said. He accused Minister for Employment and Social Protection Regina Doherty of failing to respond to their issues. Mr Collins said there is a simple solution available by amending industrial relations law to include pensioners as well as workers so they can air their grievances. He said most ESB pensioners do not have a state pension, which has risen by 9pc since 2010. "We have been offered 0.2pc, which on the average ESB pension amounts to €52 a year or €1 a week," he said. He said ESB staff got salary increases of 7.7pc over a three year period and called for a return to linking pensions with wages. A spokesperson for the Department of Employment Affairs and Social Protection said that the minister and officials from the department have previously met with the group. "Issues related to the ESB superannuation scheme are an operational matter for the Board and management of ESB, and matters related to the ESB come under the remit of the Department of Communications, Climate Action and Environment (DCCAE)," it said. "With regard to representation for pensioners, measures were introduced by this Department in 2015 to facilitate engagement between the trustees of a pension scheme and groups representing the interests of pensioners and deferred scheme members in relation to the restructuring of scheme benefits. "In relation to trustees representing pensioner interests, current legislation does not specifically provide that member trustees must include at least one or more members from each scheme membership cohort, namely, active, deferred and pensioners. "However it does provide an opportunity for membership from each cohort and such members may avail of the opportunity to become scheme trustees or nominate others to act on their behalf."